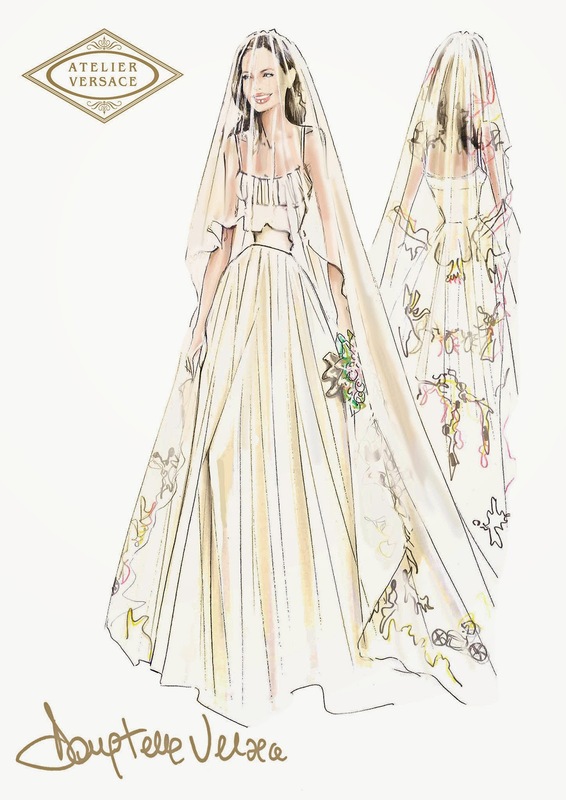 You no longer have to wonder what Angelina Jolie wore when she married Brad Pitt. A week after the couple exchanged vows at their French chateau on Aug. 23, we get our first glimpse of their wedding photos, which will appear in Wednesday's issue of People magazine as Hello! magazine internationally. 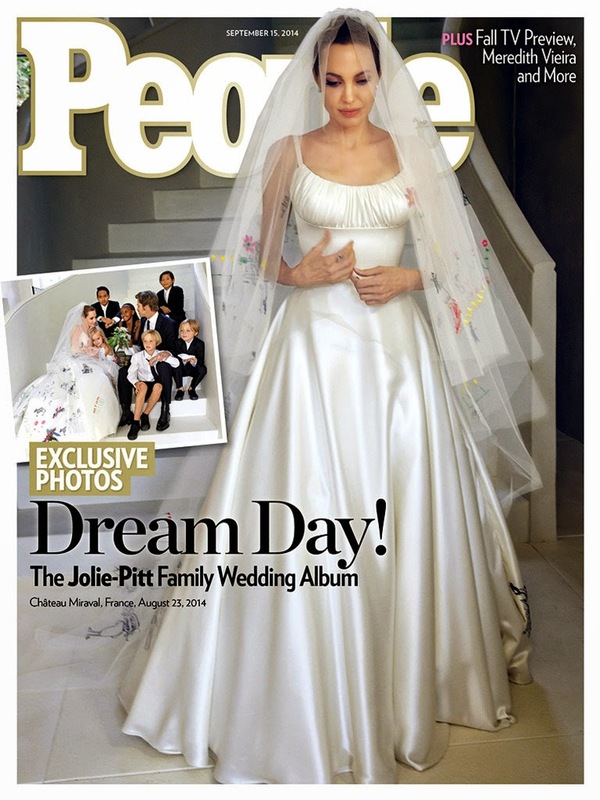 Jolie, 39, appears in full bridal regalia and there are also pictures of the bride and groom kissing and a family photo of the happy couple and their six kids. "Luigi is like family to me and I couldn't imagine anyone else making this dress," Jolie told People. "He knows and cares for the children and it was great fun putting it together." Jolie had her hair styled up for her third trip down the aisle. She wore minimal jewelry — earrings and what appears to be one ring on the index finger of her right hand. As for Brad's wardrobe for his second wedding, he recycled a suit that he already had in his closet. His tie, however, was borrowed from one of his sons because the Fury star forgot to pack his. Oops! The family photo showed the happy couple and their children — Maddox, 13; Pax, 10; Zahara, 9; Shiloh, 8; Vivienne and Knox, 6 — seated on a staircase, presumably in the chapel on the grounds of Château Miraval. People reports that those six little Jolie-Pitts were busy because they acted as "wedding planners" for their famous parents. We already knew that Maddox and Pax walked their mom down the aisle, Zahara and Vivienne were flower girls, and Shiloh and Knox were ring bearers. However, the kids also wrote their parents vows. And Pax is apparently a baker — he made the wedding cake! The boys and Shiloh all wore black suits, but hers was a shorts suit that she accessorized with a top hat. Zahara's dress was designed by family friend Adama Kebe, and Vivienne wore a white dress from her closet. "It was important to us that the day was relaxed and full of laughter," Pitt and Jolie told People. "It was such a special day to share with our children and a very happy time for our family." A total of 20 guests were there for the intimate affair, including all of Pitt's immediate family. As we previously reported, Jolie's father Jon Voight, with whom she has had a rocky relationship, did not attend and learned about it after the fact. The couple, who were together for nine years before marrying, are spending their honeymoon… working. Pitt was in England promoting Fury on Thursday and he was snapped with his wedding band on. From there, he headed to New York. Meanwhile, Jolie has been in Malta, where she is gearing up to a direct By the Sea from her own screenplay. The film co-stars her new husband, putting them back together on the big screen for the first time since 2005's Mr. & Mrs. Smith.